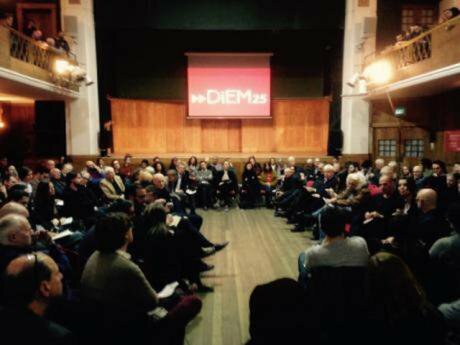 DiEM25UK launch meeting in Conway Hall, London, 8 January 2017.It is no secret that the Democracy in Europe Movement 2025 (DiEM25 UK) – its individual members and collectively – suffered an identity crisis in the months after the EU referendum. All of our campaign plans had to be rethought – we were thrown off balance. Overnight we became the only DiEM25 branch in Europe based in a state actively leaving the EU. Although our membership is comprised of people with varied political, religious and cultural backgrounds we all are, at heart, democrats; this is our common denominator. We therefore accept that the UK electorate has spoken. With this acceptance – which in all honesty did not come quickly or easily for some – came a vigorous dedication to campaign and fight for the future of an international politics for our country. Our eagerness to persist in advancing DiEM25’s goals and values has never waned despite the many obstacles we have encountered. Soon after the referendum we saw a new prime minister enter Number 10. This is a PM who had previously occupied a well-argued if lukewarm pro-EU position, but with her appointment had a surprising change of heart; what we call ‘hard Brexit’ is now one of the central doctrines of her leadership. What does this mean? Aside from an intention to categorically sever the UK from the EU this plan is desperately short on detail. It remains very unclear what relationship the UK will have with the EU and what status EU citizens in the UK and UK citizens in the EU will have post-Brexit. Maybe counter-intuitively, the government’s strategy of ‘clarity' on Brexit has only muddied the waters and made it all the more urgent to extract answers and solutions from our elected representatives. Working always in the pursuit of openness and transparency we want to tell you the story of how the UK Provisional National Committee (PNC), with the collaboration of DiEM25 UK members, came to draw up the candidate list. The idea for the candidate list was suggested to us by DiEM25 founder Yanis Varoufakis in our first PNC meeting. If you haven’t yet, we invite you to read about that meeting here. Inspired by other DiEM25 branches that had also compiled lists of qualified endorsements for candidates in their respective countries, and with the snap election just weeks away, we embraced the opportunity to do something similar. Making the most of Slack, an online discussion platform, members with an interest in policy started to compile a document which we eventually agreed to entitle ‘Principled not Tactical’. Using the DiEM25 New Deal for Europe as a foundation, we tasked ourselves to write 6 ‘principles’ against which we could measure candidates. The original paper shared with DiEM25UK members on Slack generated much discussion. There was a lot of debate about whether certain policy propositions should be spelled out at such an early stage. For instance, suggesting that we should include the need to reform our financial system through the implementation of a digital platform to remove the payments monopoly of private banks generated much debate. Yanis Varoufakis has spoken about this at length and it is a central plank DiEM25’s European New Deal. Conway Hall.Another discussion regarded the proposal that we advocate the UK joining the European Economic Area (EEA). Even if Varoufakis talked about it favorably in the media recently, it is not a solution all of our members believe in. Eventually, after lengthy conversations that sometimes extended into the middle of the night members reached a consensus, put the document to a vote open to all UK members which hopefully, members had all seen and taken the time to discuss and ratify, and agreed on the following document. Once we had our ‘Principled not Tactical’ document, we moved onto the selection of candidates. We started with a simple Excel sheet to which everyone added candidates they believed reflected some or all of the principles outlined in ‘Principled not Tactical’. The list was extremely varied and grew exponentially, reflecting the wide variety of progressive positions in DiEM25UK. Increasingly nervously we pressed on, conscious that we had limited time to complete this exercise. With this in mind, our members in a group we call Alliances – a sub team which concerns itself with the affiliations or associations between DiEM25 UK and other groups in the country – cut down the list to a representative sample of 15 names. Throughout the process, we were meticulous in considering candidates from all parties. On May 25 we sat in front of our computers satisfied with a job well done and eager to watch the DiEM25 event in Berlin. Within the first half hour Yanis Varoufakis started talking about our hard work! He talked about the list as the first largescale project taken on by the UK PNC. Our pride was quickly replaced by anxiety; Varoufakis was saying that the list contained a Conservative candidate! As explained above this was not inherently wrong. Our original list indeed had a few Conservative names but in the process of cutting it down to 15 names our list ended up with no Conservatives. This had been a particularly contentious decision. Some of us had argued that not including a Conservative contradicted our cross-party principles; others argued that even if it was possible to find many Conservatives that are against a ‘hard Brexit’, their core principles are often too far removed from those of DiEM25, and they have hardly called for a principled debate nationwide on the major issues and decisions involved. Conservatives such as Ken Clarke came up in discussion as they have spoken and voted openly against a regressive Brexit, but unfortunately we couldn’t reconcile this with a platform which was not clearly progressive in any other aspect. After hearing Varoufakis speak many of us quickly went online with the now obvious question: “do we reconsider our decision not to include a Conservative?” After yet another lengthy discussion we decided to remain faithful to our original vote, and held another online poll in Slack to make sure we agreed. It would be remiss not to mention the dreaded logistic and bureaucratic side of this lengthy process. DiEM25 UK is still in its embryonic stage. DiEM25 itself is barely a year old! One of the trickiest aspects of this process was to ensure that all decisions taken were done so democratically. We all wanted to see any proposal and any document published online for us to read and discuss. Although this is a process that takes time, it is fundamental to the democratic values of DiEM25 and therefore a principle that we shall never compromise. On top of the inner working of DiEM25 UK is our relationship to central DiEM25. Who do we send our documents to? How do we get access to all members across Europe to share our work? These are all questions we asked and learnt the answer to as we worked hard throughout these past few weeks. We’re glad we went through these struggles because we are now an even stronger group. We are a group that, not only is more aware of the processes of organizing a movement, but also a group more prepared for the next challenge. DiEM25 UK is growing rapidly and its members are intelligent, eager and opinionated. This is a reality which makes the political discussions we have extremely interesting and animated. That said, at all times, genuinely and without fail, there is an ever-present respect for each other and each person’s opinion. The process that brought us to the final candidate list can be summarized as this writer has done here, but it doesn’t do justice to the depth of the intellectual, theoretical and political conversations that took place. To conclude, we appeal to the reader not to imagine a complex hierarchical structure within DiEM25UK. Don’t be put off by acronyms like PNC and CC. We are people just like you with an internet connection and a laptop who feel that we have something to say. The list you received and the conversations referred to throughout this entry are the product of texted phone conversations during lunch breaks over early morning coffees. We are an entirely voluntary grassroots collective. We want you to join in our conversation and help bring this movement forward. Don’t be shy! To join our conversation online please email info@diem25.uk for an invitation to the DiEM25 UK channel on Slack. The original version of this piece was published on the DiEM25UK blog on June 5, 2017.